I have taken a three week holiday to spend some of it at home making soaps, baking and bush walking. Having spent some of my time off away from home eating very adventurously, I was craving a clean green wholesome meal. The backyard is a very envious herb garden and there is no end to the constant sprouting. Spring is prime time for growing mint and asparagus. 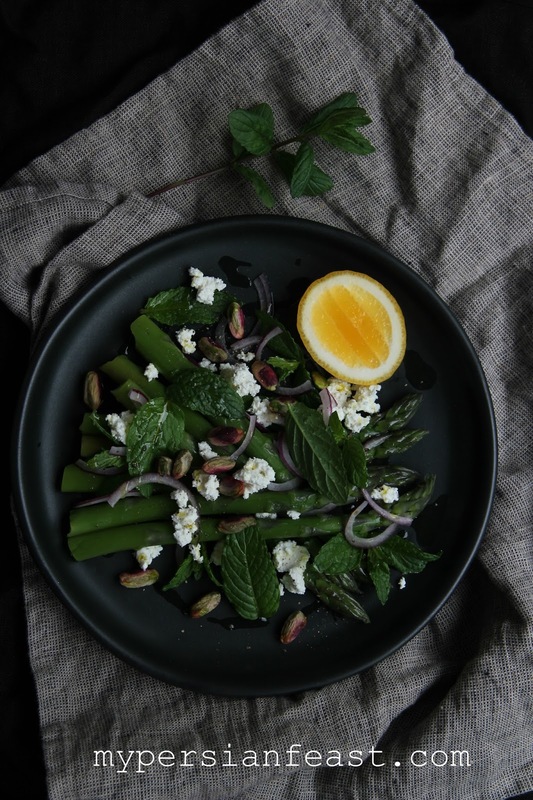 Poached eggs, asparagus and Parmesan - give me that any day and I'll polish the plate clean but today, the abundance of mint gave me an idea for a delicious salad. I can't rave enough about mint, feta and onion combination; sharp, earthy, creamy and fresh - a true explosion of flavours. It works perfectly well in salads, quiches and tarts. This time with blanched asparagus and the sweetness of crunchy raw pistachios. I will leave you with a photo only - the salad consists of blanched asparagus, red onions, raw pistachios, creamy feta, mint leaves, olive oil and salt&pepper to season. Now, a little about time away from home. I made it to Santiago and suddenly realised the money spent years ago on a Spanish course, for a South American trip that never eventuated, was the most memorable and the best investment of my life. Not only it saved me from making the wrong bookings but most importantly I could read menus and order food, and I was extremely happy that what appeared to be a complete failure years ago was suddenly a success. Here I was in the middle of Santiago, not only content that the entire trip was very heart warming and a very enjoyable experience but I wanted more foodie experiences out of this trip. We made it to the most famous empanadas place in Santiago and it was not my comfort zone - to scream at the cashier and eat standing in a cramped space holding a burning emapnada in my hand but you know what? the thought of why am I even doing this didn't cross my mind. To be honest, the empanada was probably not all that, but it was the experience of eating like the locals that made the trip even more special. The most memorable meals were eating the most basic meal of fresh fish and chicken at the markets with the locals. What surprised us on this trip was the warmth and genuineness of people we encountered. Walnut cookies are wrinkly, chewy, semi-sweet and a cross between an amaretti and a macaron - made with egg whites, sugar and ground walnuts. Walnut cookies are an oldie but a goodie! A bakery would not be complete if they didn't have walnut cookies. The last time I tried something as close as this was at a Swiss bakery. This year, we didn't buy walnuts by the kilo but by the sack ... a few sacks of them. The task of cracking kilo after kilo of walnuts took hours and hours but so satisfying in the end. Having cracked and cleaned so many kilos of walnuts, the fun of experimenting with so many different recipes began. Today, for the first time, I baked walnut cookies however, the recipe has been modified to achieve semi-sweet cookies but chewy and moreish. Growing up mum never baked, unless by a miracle she baked her 7 Spoons Yoghurt Cake. The other day, I came home to a whole tray of what mum described as walnut cookies but didn't resemble cookies, yet alone walnut cookies. 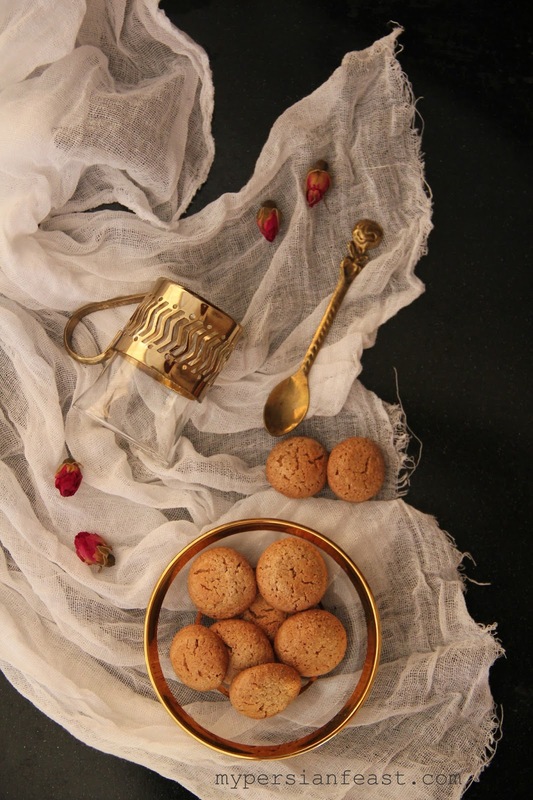 Although she still doesn't bake anything sweet, other than bread which is her forte, sometimes she surprises me with her baking. I know very well that she loves walnuts so much that she insisted, we stock up on walnuts this year because "let's face it, we can eat walnuts in any way we can" she said. She has a point. We eat walnuts in any way we can - fresh, roasted, with feta cheese on toast, in salads, in baking, with dates and in stews. I am glad we did, and I am glad she had a baking disaster so, we could use it as an opportunity to perfect a recipe. In a food processor bowl, place walnuts, egg whites and sugar. Transfer the mix into a saucepan and heat slightly until sugar has dissolved. Cool the mix, add the rest of the ingredients and mix with a spoon. Pipe 1.5cm wide circles of cookie dough on a baking tray lined with baking paper. Dip back of a teaspoon into cold water and flatten the cookie dough tops. Bake at 150C for 15 minutes. It's good to be here, even though it is once every few months. The latest from the kitchen is all about wholesome experimental food these days and occasionally I treat myself so, not much authentic cooking has been happening lately. 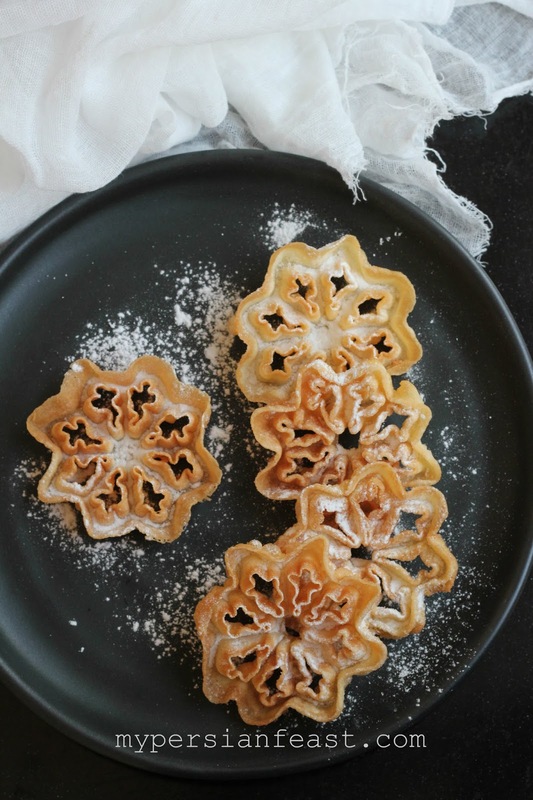 I got a chance to make rosette cookies, which are a Scandinavian treat but they are a nostalgic treat for many Persian adults. I was lucky enough to find a set of rosette irons in the local market. The cookies are rustic and fun to make. 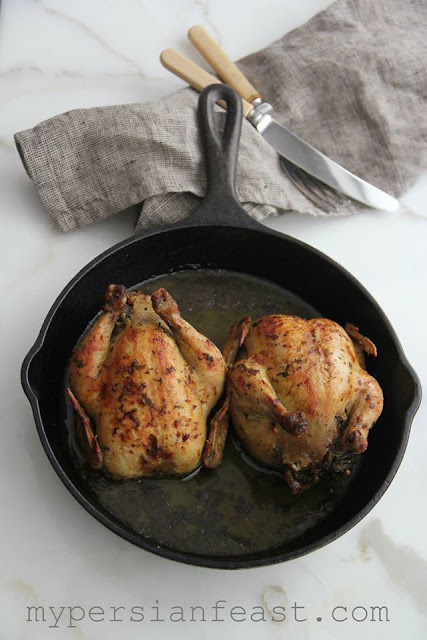 They came into existence years ago and faded away as we no longer had time to fry batter on a hot stove. As our love for everything vintage and wholesome grows, we see more and more of these old school treats making their way into our kitchens again. I was not disappointed. These are not just pretty, they are very moreish. Since my 'eating well' journey began a year ago, not only I lost some weight (and said goodbye to my favourite clothes) but I struggle to understand why food education doesn't work for everyone. I used to know someone who replied back when I questioned the way he ate, with "I have been through a lot over the last few years". Okay, I get it! We eat for emotional reasons. We are funny creatures. We reward ourselves with sugar and fat when we celebrate and tasty food is often food, high in carbs, salt, sugar or fat ... yet, we know it is not all that good for us but we do because it makes us feel good. After all, who wants to go to the movies and not have buttered popcorn?! If a massive campaign fails in a nation, like we have seen with 5+ a day, then is there hope for us and the next generation? Perhaps, there is but where the responsibility lies is not with the healthcare providers and is not with the movers and shakers of a nation. The heavy responsibility of changing habits remains in kitchens, in homes - like yours and mine. If we don't take a simple and small step towards cooking wholesome and healthy food and developing a new culture and attitude of eating then clearly there is no hope for the future. The effect of a small step taken today may only be evident in years to come and as to the person I used to know, gladly they are history! Mix eggs, milk, flour and cornflour in a bowl with a hand whisk or an electric mixer. Heat oil in a small fry pan. 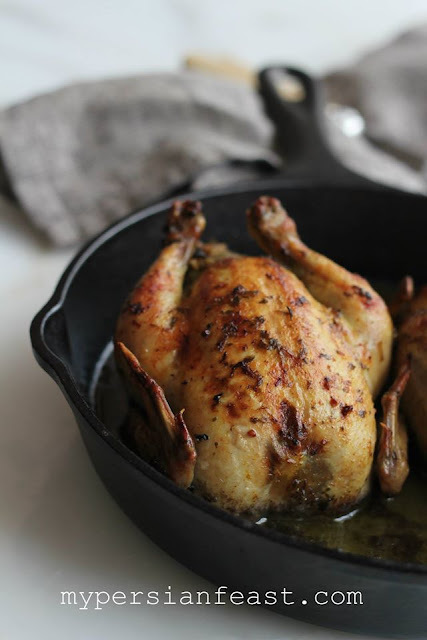 Once the oil is hot, place a rosette iron in the hot oil for a few seconds to heat it. Dip the hot rosette iron in the batter but do not fully immerse in the batter. 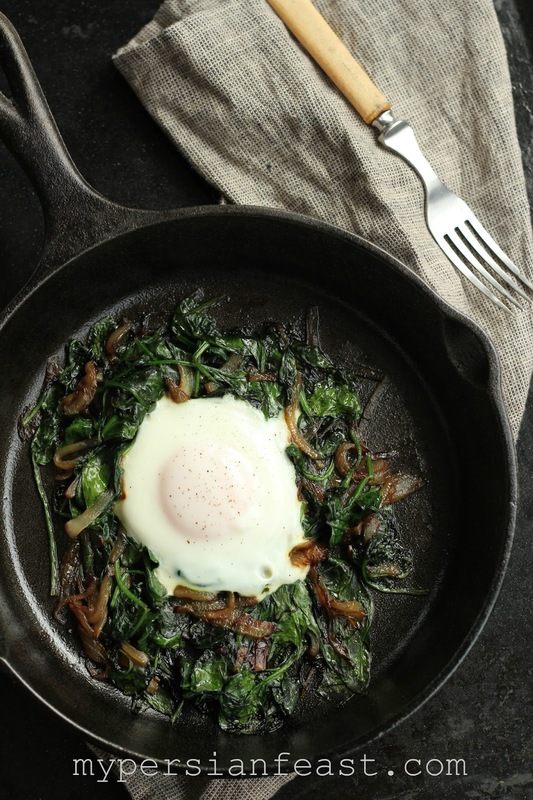 Place the iron in the fry pan. After a few seconds, the cookie peels off the hot iron. Fry until golden crunchy (about 2 minutes). Dip the rosette iron in the hot oil to keep it hot and give your batter a mix every now and then. Sugar ... We all know it's bad for us but how bad is it really? We all grew up on eating sugar in some form, whether it was sprinkled on breakfast cereals in the morning or in a cookie in the afternoon or in sauces we've made for a wholesome family meal... we've had in all possible forms too ... honey, brown sugar, caster sugar, maple syrup, glucose in lollies and all other forms hidden in packaged foods ... you name it, we've had it! We are all surviving but can we blame sugar for all our ills and aches? I don't know the answer but having been sugar free for 9 months now, I can tell you what happens when you eat a little bit of sugar. After enjoying something delicious, you'll notice a dull headache and then suddenly it hits you! Like you've just walked into a power pole (I have so, I know). The headache intensifies into a massive throbbing headache and you feel like a giant soft marshmallow then you can't decide if you want to go to bed or if an alien has just taken over your body. As you try to decide, you'll realise your body and mind are no longer connected and you simply cannot function. Going to bed and sleeping it off, is probably the wisest action you'll take except you lie in bed in physical pain feeling your intestines jumping up and down. If you've ever experienced a surgeon placing an anesthetic mask on you face and asking you to count then this is the exact same experience without ending up with stitches. The next morning you wake up feeling as if you've been discharged from the surgery ward! You'll probably spend the entire day wondering what happened to you and regretting every bite of sugar you've enjoyed the previous day! You'll end up soon back in bed for a long nap and waking up again promising yourself to stay away from sugar for as long as you shall live and you can't actually wait to tell the whole world that sugar affects your brain the way cocaine does (not because you've tried cocaine but because now you believe sugar is just as bad) and retell your story to every poor soul who doesn't give a damn about sugar! The Baha'i fast started a few days ago and it's customary in our household to eat zoolbia and bamieh at least once during the fast. Bamieh is deep fried choux pastry soaked in sugar syrup. Zoolbia is a starch and yoghurt batter fried in a lattice shape and soaked in sugar syrup. 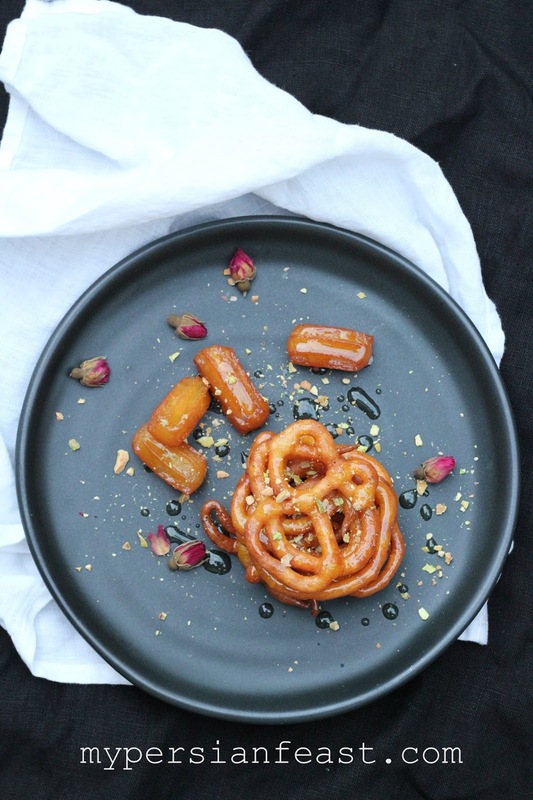 Most cuisines have a deep fried sweet dough but these are a cross between South African koeksisters and Indian gulab jamun. I strongly don't advise you to eat any of these if you are sugar free but if you are not then live dangerously. According to Wikipedia "snacking" doesn't have a concrete definition. Ask anyone, young and old, and we all agree that what we eat in between meals is a snack but depending on where in the world you are defines what a snack is. As any good Persian would tell you, snacking is not just the small portions of sweets and deep friend goodies but there are a number of sour snacks. 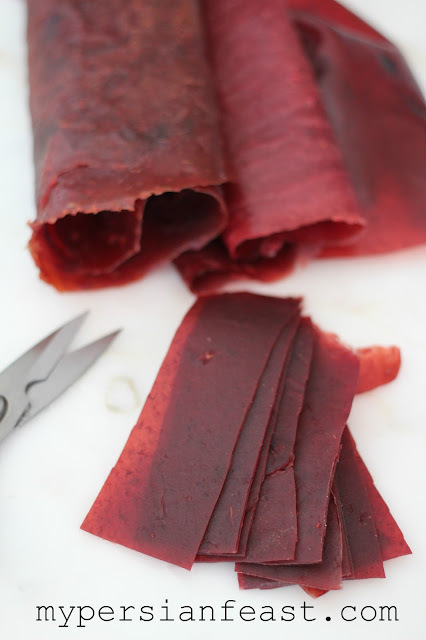 Persians have a sweet tooth and a sour tooth, and a Persian childhood is not complete without eating sour cherries, sour plums and sour fruit leather. 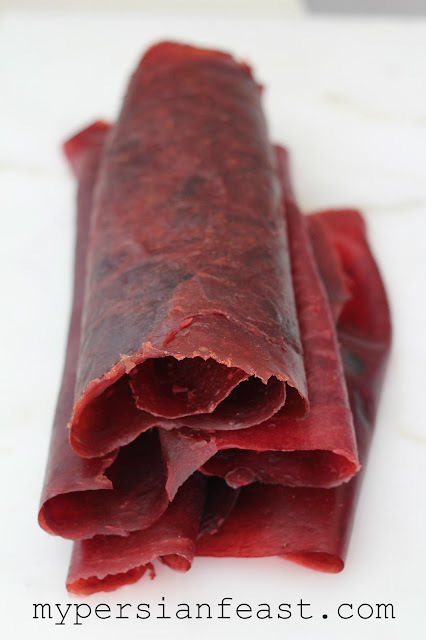 Fruit leather (Lavashak, literally meaning baby lavash) is a thin, flat large piece of fruit puree dried on large trays in the summer sun and eaten as a winter snack. Surprisingly, summer fruit turns very sour when cooked into a paste. No sugar and sweet fruit such as bananas are added to sweeten them. These are as pure as fruit. If you have plenty of summer fruit and are willing to give this a go, simply reduce a pot full of fruit into a puree and pour a 1cm thickness of fruit puree on a baking tray. You can either dry them in your oven at 40C or in the sun (30C for two days). If you prefer to sun dry them, best to cover your trays with a cheese cloth. Apple and any stone fruit is a good combination. Best to use non-stick trays and no need to brush the trays with oil.